While your real reward is knowing that you're taking steps to fight suicide, these incentives are our way to say thank you for your efforts. Trip for two to New York City including roundtrip airfare, two nights lodging, and two VIP tickets to AFSP's Lifesavers Dinner gala event May 2019. Top fundraiser will be determined based on funds raised by December 31, 2018. Effective for Out of the Darkness Community Walks taking place fall 2018-spring 2019. Walkers who have raised less than $150 are welcome to walk and join us for an inspirational event including entertainment, memory activities, sights, sounds, and camaraderie, but will not receive an Out of the Darkness Walk T-shirt. With the exception of the official Out of the Darkness Walk t-shirts ($150 level), incentive items are not cumulative; only one item is awarded to each fundraiser. T-shirts are distributed at the walk only. Gifts are awarded based on individual fundraising efforts, not team totals. Fundraisers may select one item at or below the level achieved. Matching gifts are included in fundraising totals if the walker provides the appropriate matching gift form when turning in the eligible donation. Approximately 4 weeks post event, certificates for all additional incentives are emailed from thankyou@afsp.org, please add to your address book. The American Foundation for Suicide Prevention reserves the right to substitute an incentive item of equal or greater value. Offer valid for Fall 2018-Spring 2019 Out of the Darkness COMMUNITY WALKS only. 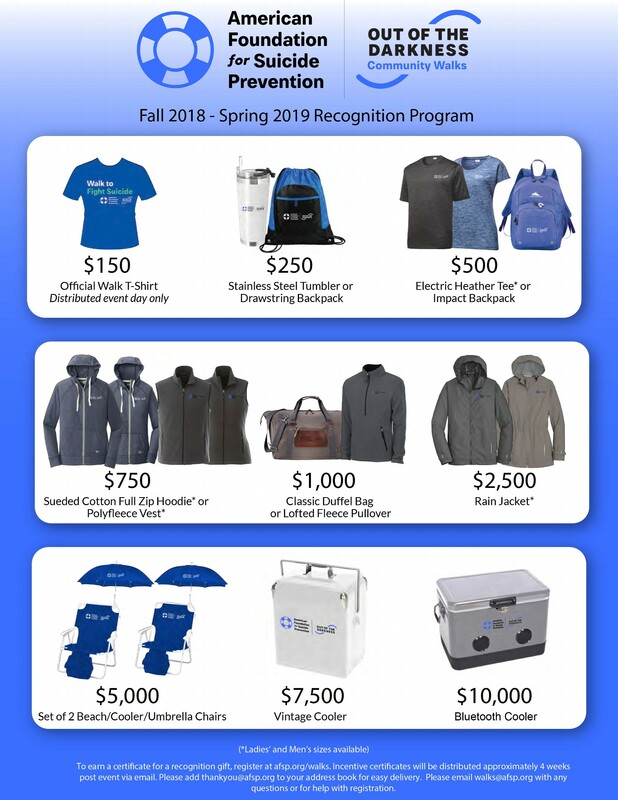 Click HERE to view last year's recognition gift flyer (fall 2017-spring 2018).